Contact Vision2 for a demo of our comprehensive church giving software! If your church wants to make giving more convenient for all of your members and processing gifts easier for your team, it’s likely that you’ve looked into adopting a church giving platform. 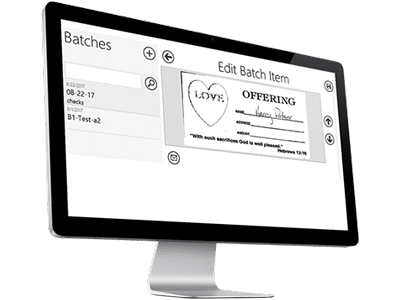 Church online giving platforms are comprehensive software systems that make it easy for your congregants to give whenever and wherever they are and make it easy for your church to manage incoming gifts. 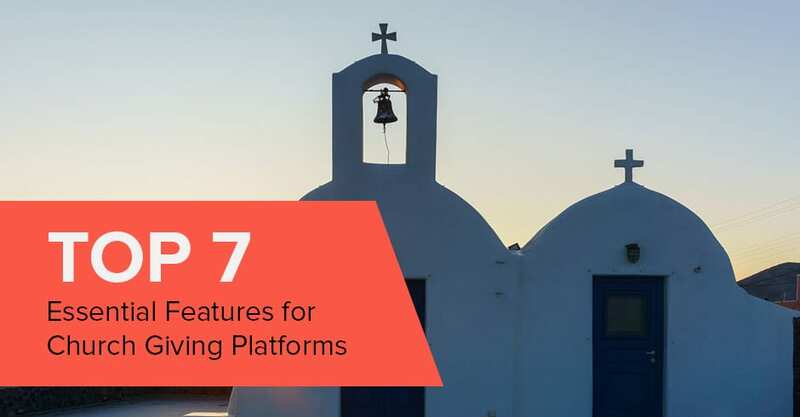 Choosing the right church giving platform begins with identifying your church’s needs. How big is your church? Do you have multiple campuses? What software systems do you already have in place? You need to look for the church giving platform that best suits your unique church community. Your church’s plans are also important to consider as you compare platforms. Perhaps you’re trying to grow your congregation, spread your message abroad by sending members on mission trips, or expand your programs to meet the changing and growing needs of your church community. The right church giving platform can help you reach all of these goals and more! What is a church giving platform? To get started, let’s answer the first question that most churches have about these software systems: what is a church giving platform? 1. What is a church giving platform? A church giving platform incorporates all of the best features of traditional online giving software solutions for nonprofits but keeps the focus on your church’s mission. Church online giving platforms are designed to help your members give back to the church community that has facilitated their spiritual growth and strengthened their relationships with God. Familiar messaging and visual elements. With the right church online giving platform, your members won’t feel as though they’ve been redirected to a new and unfamiliar website when they choose to give online or via mobile. You’ll be able to customize your giving page to look just like any other page on your website, meaning that you can keep the central message of the page focused on the good work your church does. Ways to direct their gifts. Your church supports the community in numerous ways each day, from creating new programs for your members to expanding your place of worship to serve a larger congregation. Your members can use your church online giving platform to specify which ministry or project they would like their gifts to support. Plenty of giving options. It’s likely that all of your members want to support the church community from which they have benefited, but it’s just as certain that they’ll want to do so in different ways. The best church giving platforms offer your members a variety of online and traditional giving methods, ensuring that there’s something for everyone! Church giving platforms help your members and your team manage each step of the giving process, from deciding where to direct gifts to ensuring that they’re accounted for in your church’s finances. A provider such as Vision2 can offer more information about how these software solutions work and how your church can incorporate one into your giving process. Once your church has made the decision to adopt a church online giving platform, your team will spend time researching and comparing the options available to you. One of the most important components of any solution you’ll consider is its online giving capabilities. With the popularity of online giving on the rise, it’s important that your church chooses a church giving platform that makes this popular giving method easy for your congregation. The right church online giving platform balances convenience with personalization to create the ideal giving experience for your members. A customizable online giving page. It’s likely that your church is involved in multiple ministries or projects at once, and your members want the opportunity to choose which ones to support. Look for a church online giving platform that allows you to customize your giving page with plenty of information on each of the projects toward which members can give. Including multimedia elements such as photos can help members feel more connected to the projects they’re about to support. Integration with your existing website. The best online giving pages look just like the rest of your website. Familiar elements such as your church’s name, logo, and other identifiers make the online page more trustworthy to your members, especially when your church online giving platform is new! When you choose a platform that integrates with your current website and other systems, you’ll also save your church’s team a lot of time and effort. Personalized communications. You value each of your members and the unique contributions they bring to your church community. Demonstrate this appreciation each time they give by selecting a church online giving platform that allows you to send personalized thank-yous and other messages to individual members before and after they make their gifts. Online giving for churches motivates your congregation to give back to the church community that has supported them and makes it easier for your church to continue and expand the programs that your members value. With the right church giving platform, the online giving process can be just as meaningful to individual members as traditional giving methods. One of the great benefits of online giving is that members don’t have to be in a certain place to make their contributions. Your church can make giving on-the-go even more accessible by choosing a church online giving platform that offers mobile giving and text-to-give options. There’s no getting around the fact that most of us are never too far away from our smartphones. While you may perceive the phones as a distraction right now, with the right church online giving platform you can transform them into one of the most effective giving tools available to your church. Look for a church giving platform that offers your members two convenient ways to support your church from their phones: mobile giving and text-to-give service. Most smartphone users think of their phones as small computers that they can use to access all of the online content that they would be able to interact with on their desktops or laptops. Thus, your church’s online giving page should be mobile-responsive so that members don’t have to be at their computers to contribute. Want to make mobile giving even more convenient? Ensure that your members can access your giving page via mobile without having to download a separate app. The longer they have to spend on the giving process, the less likely they are to complete their gifts. The giving process should be fun, not tedious! If your members already access important information about your church such as upcoming events and services via an app, look for a church online giving platform that integrates with your current app. This way, your congregation will be able to start giving on their phones with no additional downloads required. 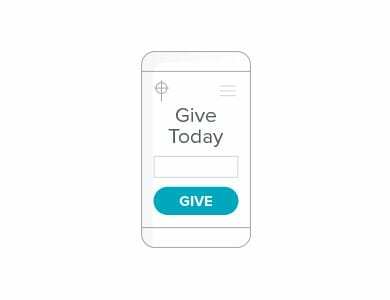 To make giving via mobile even more convenient, look for a church online giving platform that offers both mobile giving capabilities and text-to-give service. While you may associate texting with millennials and other young members of your church, you probably have many members across age groups who would appreciate the opportunity to contribute via text. With text-to-give service, members can give to your church just by sending a text! Here’s how it works: Your church giving platform assigns your church a keyword, such as a portion of your church’s name, and a designated text-to-give number. Next, your members text the keyword to the designated text-to-give number. In response to their text, they’ll receive a link to a simple online giving form that they can complete on their phone. Text-to-give is one of the most convenient forms of giving around and works particularly well at church events. 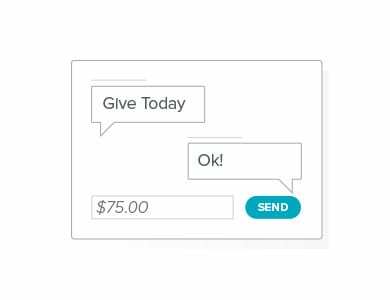 Provide members with text-to-give information so that they can contribute after services, during church community events, and whenever else they feel motivated to give. Text-to-give information is also highly shareable. If your church is on social media, post the information to encourage your members to support your current ministry or project. You can also provide the information at physical locations within your church, such as the church bulletin. While online and mobile giving are likely to be some of your church’s most popular giving methods due to their convenience, for some members of your church, the continuation of traditional giving methods is an important part of their interaction with your community. Your church online giving platform can facilitate traditional giving methods as well as online options. The best church online giving systems are those that provide your members with the most options when it comes to deciding how they want to give. Some members will prefer to give using traditional methods such as checks. Your church giving platform can help your team process these gifts, direct them to the right places, and keep track of your members’ giving. One of the most useful features your church giving platform can offer when it comes to giving by check is check scanning. Just by scanning the check, you gather such important information as the sender’s name and information, the amount of the gift, and any additional information the sender provided as a memo. Your church giving platform automatically stores this information, so your team doesn’t have to enter any of it manually. Keeping track of your members’ giving histories is essential for structuring your communications toward them. When you scan a check that one of your members has given, the information contained in the check will be added to that member’s profile within your church giving platform. You’ll always be able to access up-to-date histories for each of your generous members. To give your members as many giving options as possible, look for a church giving platform that can scan any type of check or paper currency. Providing more options motivates more of your members to give. Have a lot of members who prefer to give using checks? Choose a church giving platform that allows you to scan them in groups and organize the information within your system in a way that’s most convenient for your church’s team. Traditional giving methods tend to be popular among members who are used to making recurring contributions in these ways. It’s likely that your church has many members who closely associate cash giving with the traditional church offering or tithe. Your church giving platform can provide them with this giving option. Many members are accustomed to making their gifts to your church using cash. Your church online giving platform can help your team process and keep track of these gifts. Look for a church giving platform that makes it easy to identify where cash gifts came from and where they’re headed within your church’s broader mission. With a church online giving platform, you’ll be able to scan an envelope containing cash just as you would a check. Churches often provide these envelopes for cash gifts. This way, the same important information that you would collect from a gift made via check, such as the giving member’s name and their reason or intended purpose for their gift, is recorded in your system. Cash gifts don’t have to require extra work on the part of your team: your church giving platform’s envelope scanning feature eliminates the need for your team to manually input information, while automatic deposit tickets mean that you don’t need another system to have a record of cash gifts. However your members choose to give, a good church online giving platform will be able to accept their contributions, direct them toward the ministry or project they were intended to support, and minimize the amounts of valuable time and energy your team has to put into processing the gifts. Whether or not your members choose to make their gifts through primarily online methods, primarily traditional methods, or a combination of multiple methods, they can access their giving histories and more information through their own self-serve portals. When your church encourages your members to give using their preferred methods and schedules, they’ll be more motivated to support your church. 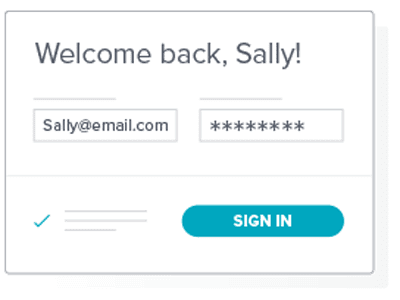 Church giving platforms that provide each member with a self-serve portal make giving easy and encourage recurring giving. When a member logs into their self-serve portal, they’ll be able to access records of their past gifts, including the amounts they gave, the giving methods they chose, and the specific ministries or projects toward which they chose to make their contributions. If they want to provide more information for your church, they can make updates to their member profiles. Recurring giving, in the forms of tithes, offerings, and other regular gifts, is a common practice among church members. One of the most important features of online giving platforms designed especially for churches is that they’re set up to make recurring giving easy. 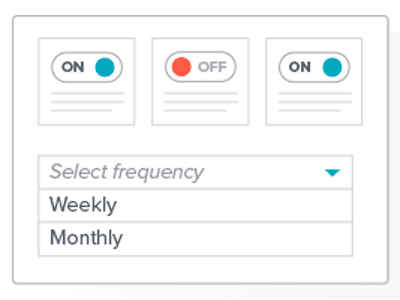 Using their self-serve portals, your church’s members can set and update the amounts and frequencies of their recurring gifts. They can make their schedules as flexible as they choose, providing them with control over their giving. Recurring gifts also ensure that your members are able to provide their church community with consistent support without having to remember to restart the giving process each week or month. It’s almost certain that your members are already making recurring gifts. Don’t worry—your church won’t lose all of their giving histories and other important information! With the right church online giving platform, your members will be able to transfer and update their recurring giving schedules smoothly using the new system. Recurring giving is an important component of church giving, providing your church community with a source of continued support that you can use to provide more for your members and expand to serve even more people in your community. Church online giving platforms make recurring giving easy by automating parts of the process while allowing members to retain complete control of their giving schedules. Whether they’re newer members transitioning from first-time to recurring giving or your long-time members, everyone will appreciate the ability to use their self-serve portal to make updates to their giving schedules as necessary. Beyond the amounts and frequencies of their gifts, they’ll be able to see and make updates to the funds, ministries, and projects they’re currently supporting. Changes in payment methods are inevitable, but they can create strains on your members’ and team’s valuable time. Church online giving systems resolve this issue by allowing members to update their own payment methods when they want or need to make changes. If their current payment method may cause a problem in the future—for instance, a credit card that is about to expire—your church giving platform will send them an automated message reminding them to update it so that they can continue supporting the programs that matter to them. Your church’s switch to a more comprehensive church online giving platform shouldn’t require any effort from your members. Make sure that you choose a church giving platform that allows you to transfer their giving schedules and payment information over to the new system so that they don’t have to make any changes or updates unless they choose to do so. Whenever your members give to your church, you need to reach out to them with a personalized thank-you. Using your church giving platform, you can create communications that allow you to reach out to individual members and connect with them over your goals and mission. Just as each of your members has enjoyed a unique experience as a member of your church community, each member has their own unique set of reasons for supporting your church. With numerous funds and ministries simultaneously in action, it’s almost certain that different members will take a special interest in different projects. You can use your church giving platform to address your members’ individual interests and reasons for supporting your church. Want to make effective use of your church online giving platform’s automated communications features? Begin by segmenting your members according to categories such as the length of their membership in your church thus far, the programs they’ve been interested in the past, and the frequency of their contributions. First-time supporters will respond well to different communications than will long-time members, just as your members who are interested in children’s and family programs will appreciate different communications than those sent to members without children. Creating different communications for different groups of members encourages everyone to give. 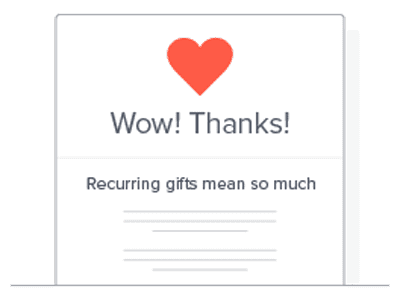 While your church will certainly use your giving platform’s automated communications feature to spread the word about your newest fund or ministry, don’t forget the most important function of this feature: thanking your members. Without their gifts, your church cannot continue and expand your community and your good work. Thank-yous should always be as personalized as possible, communicating to each member their individual significance. Church online giving platforms make giving convenient for your members and engage them more closely in your church’s work. They’ll be encouraged to give, and your church community will grow stronger as a result. The Smart Buyer’s Guide to Choosing Church Giving Software. Searching for just the right church giving software solution? Follow this guide to help ensure that you make the right choice for your church. Why is Merging Membership Information with Financial Data Important for Churches? A comprehensive software system can help your church learn more about your members and their reasons for supporting you. Learn how you can make better use of the data you’re already storing. Vision2 Product Insights: Know Thy First-Time Giver. Your church giving platform may encourage some new members to make their first gifts to your church. Use this guide to learn how you can keep them engaged. Ready to get started with church online giving software? Contact Vision2 for a demo of our comprehensive software solution!